STRIPER SOUP :: View topic - Congrats to the Champions! Posted: Sun Oct 31, 2010 3:47 pm Post subject: Congrats to the Champions! Jeff Gerrin was fishing with them also, sounds like the "Dream Team" for Lake Lanier Congrats to all! Talk about loading the team! WTG super soupers! I'm proud to have you guys on the forum! Tim, are you gonna quit your day job for the tx trail? Posted: Sun Oct 31, 2010 8:34 pm Post subject: Thanks! That's right 3 soupers are your national champions!! Skiffy also named us the "Dream Team". Fishing was great, the company was great - the three of us all thoughly enjoyed ourselfs, the winning was just a bonus. We used ALL bait techniques - planers, flat, floaters, transom, down rod, cut/live on the bottom and pitching. Gizzards and trout from 4 in to 18 in. The three of us are seem to be from the same school - letting the FISH tell us, what THEY want. We were just good listeners this Fri/Sat. I couldn't have had better teamates - both great fishermen, funny, relaxed & hard working. It was true team effort with all three of us agreeing when to move, where to move too, etc. Saturday morning was a highlight - we got to the 1st spot and promptly hooked up a triple, all right around 14.5lbs, not a bad way to start the day. Later on Sat I hooked a "Dink" on a downrod, that turned out to be our big fish of the tournament and won us BIG FISH money for Saturday's Team tournament. It turned out to be 24 something pounds. My story is that to BIG FISH Mike, a 24lber is a DINK! I had a loose drag on that 9ft down rods, so I could really tell how big it was. Another fun thing was we caught 2, including our Friday big fish of 21lbs on the transom rods - the hook not 10 or 12 ft from the rod tip - again with loose drags! Three of the 4 fish we weighted in were caught within 10ft of the boat. We all KNOW how boat shy these stripers are! I'm sure both Jeff and Tim will chip in at some point. Thanks to Tim for dealing with the DA' Barge in the current, as he drove the trolling motor both days. I was on VAC! We have agreed to fish the next tournament in Hartwell on 1/29/11, but I don't think anyone is going to retire just yet! It was awesome just to watch and listen to these guys at the weigh-in Sat. afternoon. Listening to that group of guys talk of their experiences over the two days was priceless. If I remember correctly total winning weight was 71+ lbs.? CONGRATS Mike, Tim, and Jeff! Thanks for the memories. Thanks guys! Rocky Fulmer had us covered but dropped the ball on Day two. Jeff and I can be dangerous when teamed up but then add Mike to the mix on Lanier in October and I like our odds pretty good. I felt like we made good decisions and the fish actually stayed where they should for a change. Rain, mud and high pressure were definitely a blessing in disquise. As Mike says, "rule number one: stick to you plan - rule number two: be flexible", we did both and had a little luck mixed in. Posted: Mon Nov 01, 2010 11:10 am Post subject: A "Dink" was the biggest fish? Congrats to you guys. I guess telling little white lies got us in the long run. Posted: Mon Nov 01, 2010 3:19 pm Post subject: Woody - I said "DINK"! When the 24.5 hit, it just happend to be right next to ME. I grabbed the rod and felt it was a decent fish, I was afraid I would screw up and lose it, so I told Tim and Jeff it was dink - so when it got away they wouldn't throw my off my own boat!! Thanks again for the kind words folks. Thanks to everone. 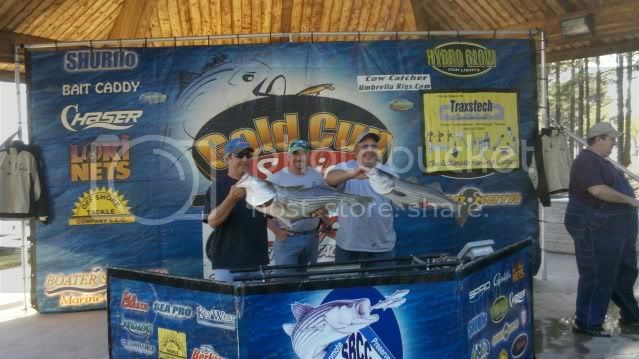 It was one of the funnest tournys I have fished. It was great karma on the barge. We all pictched in what we thought conversed and made a call on what to do and where to go. It almost always worked to our advantage. It was fun fishing with two great fishermen on one heck of a fishing machine. I even caught a fish with no hands pitching baits. The phone rang after I had made my cast and I was punching a customers phone number in my phone with the rod between my legs when it got hammered. I set the hook with a hip swing and tried to get Tims attension. He came to my rescue and landed the fish. It looked pretty funny. Can't wait until the next time. Win or lose I'm sure we will have a blast. Congrats on the win guys. Sounds like you had a super time. Congrats guys !. The only other thing I can say is that I wish I was there on DA' Barge with you. Congrats to the "Dream Team!!!" Promise I wasn't trying to steal that planer board. I was playing the part of "board boy" and returning lost property for a little while. Knew it was y'alls...green duct tape gave it away (Souper Engineering). Congrats to all who caught fish in the TX. Skiff I know you would not steal. Should have seen my HOT PINK ones. I don't know if Tim and Mike were comfortable pulling pink boards. They didn't say anything. The bright green and the pink stand out real good. Here is the photo I took of you guys..hope you don't mind it being posted. Sorry about the late post, but WAY TO GO GUYS! sounds like you definitely have a power team of great anglers. It is great to have such knowledgeable fishemen on the soup.